If you’re deeply in debt with student loans, your definitely not alone. 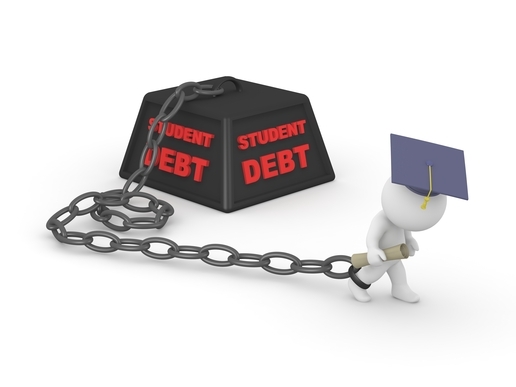 America’s outstanding student loan debt balance is currently $1.3 trillion and growing, making it the country’s largest debt – larger even than our total household debt or credit card debt. Even scarier is the fact that it grows at the rate of $2726 … every second! Yes, you read that right. It grows that much every second. Presidential candidate Hillary Clinton has championed student loan interest rate cuts, help for delinquent borrowers, a path to debt-free public college and a three-month moratorium on all student loan payments. Of course, campaign promises like these tend to evaporate once the candidate is elected and has to face the reality of dealing with Congress. Until just a few years ago student loan repaymentt was pretty much like a mortgage. The repayment term was 10 years with extended plans that went to 25 years. If you fell more than 90 days behind on a payment you were considered to be “delinquent” and if you became nine months behind you were in “default”. And if your loans went into default it meant a jump in interest rates along with penalties. Plus, unlike a mortgage, there was no way to get relief by filing for bankruptcy. Pres. Obama’s administration has made repaying student loans more affordable for more people. In fact, today anyone that has a federally subsidized direct loan can get their monthly payments capped at 10% of their discretionary income. And discretionary income is calculated as your total income less 150% of the poverty level for your household size. Here’s a brief video that explains the differences between subsidized and unsubsidized student loans as well as the serious consequences you’d suffer if your loan were to go into default. Each of these plans has a different repayment period. With the REPAYE Plan you would have a 20-year term assuming all the loans you’re repaying were for undergraduate study. The PAYE Plan has a 20-year term. The term of the IBR Plan is also 20 years if you were a new borrower on or after July 1, 2014. And the ICR Plan has a 25-year term. Each of these plans have their own eligibility requirements. For example, to qualify for the IBR and PAYE plans your payment (based on your family size and income) needs to be less than what you would pay under the Standard Repayment Plan with a repayment period of 10 years. Note: To see if you would be eligible for any these four plans you will need to go to the Federal Student Aid website where you’ll find complete details. Here’s also a brief video that explains the differences between subsidized and unsubsidized student loans as well as the serious consequences when a loan goes into default. Many people with outstanding student loans have opted for income-based repayment. However, the federal government has a challenge — to reach people that have a small amount of debt and no degree to show for their loans. This is what one professor who researches higher education finance has termed the high-low paradox. This is the fact that people with balances of less than $10,000 account for two-thirds of all defaulters. These are typically people who attended only a few semesters of school. Research shows that they are likely to be unemployed or have low incomes. Conversely, students with high balances – close to six figures or higher – are much more likely to be enrolled in, or have earned degrees from graduate programs, that generally provide a substantial return on investment over a lifetime. Typical of these are MBAs, doctors and lawyers. The good news for people that are “low balance” is that they have access to plans such as REPAYE and PAYE where their payments would be based on their incomes and could save them from long-term financial nightmares. According to the Consumer Finance Protection Bureau 70% of student loan borrowers who are in default on their loans would actually be eligible for plans where they would have lower monthly payments. There are new proposed federal rules that could make it possible for people to get their federal student loan debt forgiven – if they were misled or cheated by their colleges. There is already a “defense to repayment” process for getting relief from federal student loans but it is complicated and subject to different rules in different states. This process went practically unused until the collapse of Corinthian College. More than 23,000 claims for forgiveness have been filed since then and the government has wiped out the debt of more than 2000 people so far. These proposed regulations are meant to protect student borrowers and taxpayers against predatory practices by postsecondary schools and especially for-profit colleges. They strengthen and clarify existing regulations and would streamline relief for federal student loan borrowers who have been wronged. According to these new regulations Direct Loan borrowers that believe they have been damaged by their schools could seek relief by having their loans discharged. So the good news is if you can make the case that your school deceived you, you might not have to repay those student loans. But someone will end up repaying them and, as is usually the case, that someone will be us, the American taxpayer.